Few feelings are worse than returning to where you are certain you left your motorcycle only to find that it is no longer there. You futilely look up and down the street hoping that you might have mistakenly parked it on an adjacent block, knowing full well that you hadn’t. I count myself as one of the growing statistics of riders that has had a motorcycle stolen. Mine was an all too common account of leaving my bike parked in front of my Girlfriend’s building downtown. It was one of the rare occasions that I hadn’t used my disc lock, and I still remember vividly the feeling of my stomach sinking as I came to the realization that my precious two- wheel steed was gone. Although ICBC Statistics have shown vehicle thefts have fallen to almost half of what they were in 2009 it is still not unheard of for motorcycles to go missing. The following are some ideas that should help in securing your motorcycle to make sure you never have to experience such loss. What can I do to protect my bike from getting stolen? Nothing deters thieves like an expensive disc lock/chain combination. You cannot buy the cheap ones, nor can you use a bicycle “U” lock. In the realm of locks you get what you pay for. Once you have the locks it is best to use them on the back wheel and run the chain through the frame of the bike if possible. It is far harder for a thief to swap out the rear wheel than the front, and locking it through the frame means the thief is left with no choice but to defeat the locking or chain mechanism itself. 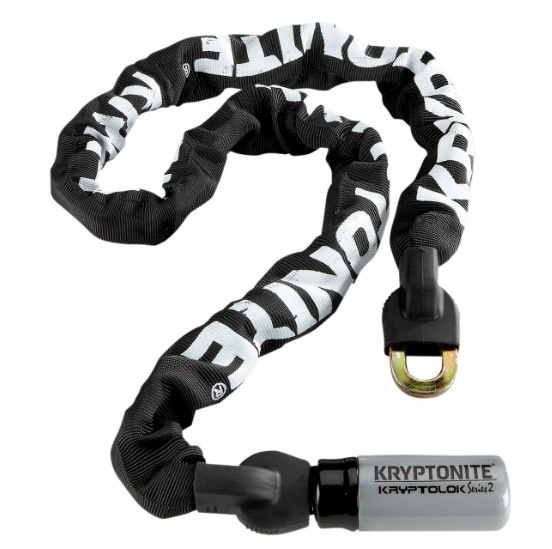 People in the know recommend NYC fughetaboutit chain/lock from Kryptonite or something of a similar caliber. If you use a chain try to fix it in such a way that it doesn’t touch the ground; the common way to cut said chain is to use a long bolt cutter, one end on the ground, the other pressed with the thief’s body weight. If they use a grinder, a hanging chain is far harder to cut than a chain lying on the ground. If you are using a Disc lock you might want to consider stripping at least one rotor bolt. This will make it difficult for any would-be thief to simply replace the locked rotor with a new one. 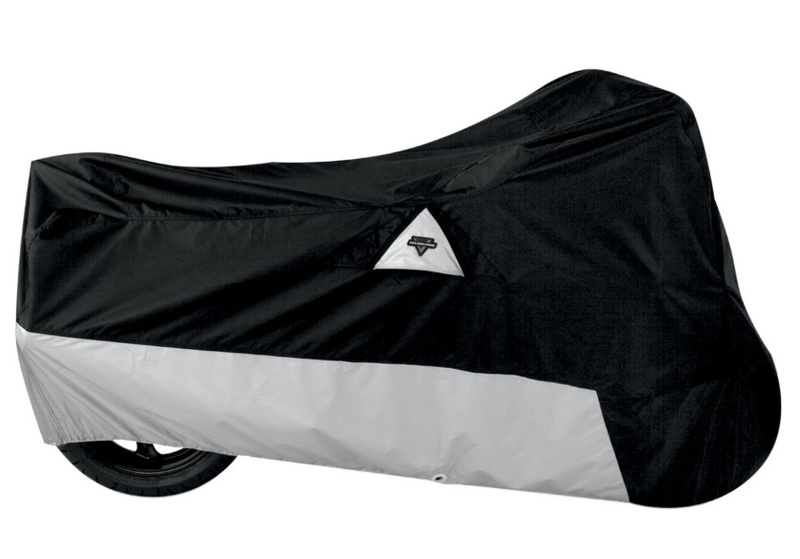 The other best option is to make your bike invisible, failing that buy a cover, preferably one that locks. This will, as often as not, cause the would-be thief to look for easier prey, not having to run neither risk nor waste the time stalking an undesirable bike. Alarms are only good if you are willing to run out into the dark to face a man or two usually in full gear, wielding potential tools and a desire not to go to prison. Lojack is only helpful in recovering a motorcycle and more often than not the thief will easily find and disable it. If the thief is smart they will deliver the bike to a deep underground parking and then take their time going through the bike looking for the lojack. If it is successful in leading the police to the bike the fastest, easiest (and probably most fun) way for the police to end a pursuit is to crash into them… still want that bike back? New to the market are GPS Tiles; small key chain size devices that help you locate any item to which they are attached with the help of a cell phone. They are far more affordable and do not require a monthly fee, but once again, great to help you recover your bike, not from losing it in the first place. 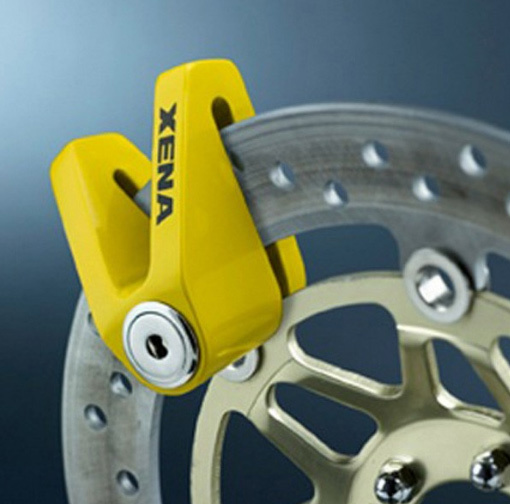 A really easy, if not practical way, to stop your bike from getting stolen is to remove the clutch leaver. This is more a sabotage than prevention, but works a charm in a pinch. Where is the best place to park it to dissuade thieves? I was quite surprised to find out the worst place to park a motorcycle was in or around a large high-rise building. Apparently this is where thieves go to shop: from your top end professional to your neighborhood crackhead, they can all be found in and around large residential areas. It is the combination of the concentration of motorcycles and the anonymity that densely populated high-rises afford. If you think your bike is safe in underground parking, think again. Don’t be lulled into a false sense of security when the gate closes behind you. Garages are often empty, unwatched and easy to get into with lots of stairwells to escape from. And parking in front of the large building is no better due to the “diffusion of responsibility”… look it up, it’s a thing. Even if you live in a nice neighbourhood, that’s not a guarantee of security either. Unless it is a gated community, nice parts of town are the areas where thieves go to “shop” for bikes. So where is the best place to park your bike? In your bedroom. Failing that a private garage or in a place where few people come and go; and those that do all know the bike is yours. Who is stealing my bike? Generally speaking there are two types of thieves: the thinkers and the doers. “Thinkers” are meticulous. They will scope out your bike for days. These are the guys that prey on you. By this I mean they will take the time to learn your schedule and your bike. They will learn when it will be there but you will not. They will have had a close look. They will have bumped it to test if there is an alarm and checked for a Lojack. When they show up to take it they will often have the tools and parts to simply replace your ignition and brake rotor rather than defeating the steering and disc locks. These are the guys that can get around your immobilizer by simply replacing it. The “Doers” are the joyriding punks that often commit crimes of opportunity. They look for easy targets that are old and/or not well protected. They often don’t plan that far ahead and are often the ones that get caught. Either way, the odds are the thief will ride the bike away. It is far more stealthy to show up on foot or “2up’d”, dressed like the bike is theirs; in other words, hiding in plain sight. If you find that your bike has been tampered with remember that it might not be a failed attempt, they might be coming back later with the appropriate tools to finish the job. If they are successful they simply ride off. The idea that it is a couple guys physically picking up the bike and putting it in the back of a truck is a myth. It is far too easy to get caught this way. Trucks are large, loud and have licence plates. If you where the thief which would you rather flee with; a large, slow moving truck, or a nimble and fast motorcycle? Good choice. Be very careful who let know where the bike lives. For example, the person or people whom sell you the bike or even service the bike (whether large dealership employees, small garage mechanic or even individual) can easily find out where you live, or more importantly, where your bike lives by looking on the transfer form or your insurance papers. It would not be hard for them to get a spare key for the bike and simply have to show up and ride off on it. The good news it is extremely unlikely that you will get “jumped” for your bike… well around here anyway. It is far too much of a “heat score” to physically take a bike from the rider. But keep this in mind when you travel, it is far more common when riding in other parts of the world. Not to mention all the scams that are involved in renting bikes in tourist destinations. But I will save that for another article. How easy is it to steal a motorcycle? Our story. On Canada Day, we received a call from a former student. His motorcycle would not start and he had to leave it in a parkade downtown overnight. He wanted it moved somewhere safer. We were nearby so we went to the parkade to pick it up. The big challenge, the owner would not be present. We could not park nearby so we settled on a alley nearby. Walking into parkade we easily found the motorcycle. We rolled it to the exit booth and talked with the attendant. We explained that we did not have a ticket and the bike was broken. The attendant was more concerned about the missing ticket than the random, plain clothed person pushing a motorcycle. Even with no proof of ownership the attendant waved us through. The motorcycle was pushed down the sidewalk, between people, around the corner and into our waiting transport truck. That is just how easy it is. Scary. What bikes are most often taken? New sport bikes, not surprisingly, are the most commonly stolen bikes. If it is older than 7 years the value falls significantly. Also of high value to thieves are expensive bikes: your Harleys, Ducati’s and BMWs, etc. These are sought after simply because the parts are more rare, expensive, and harder to steal. If your bike is old, common and missing, odds are it is just being joy ridden and will be found at some point in some state of disrepair, and probably painted mat black. The older bikes, from the 90’s, were quite easy to steal: a screwdriver forced into the lock and then cranked over would do the trick. Now technology has gotten to the point where immobilizers and chipped keys are making it far more difficult… but not impossible. It is also important to note that it is very easy to “part” a bike out. If you leave your bike in a vulnerable place it might start missing parts from it. I lost a mirror and brake lever one night a few years ago. I am guessing someone with the same bike dropped it on the right side and broke those two items. Call the police! Don’t forget to report it to ICBC, they will most likely need the incident number that you will get from the Police. Put the word out; let everyone you know via Social Media. Put a search alert up on your local Craigslist/Kijiji/Auto Trader. These sites can be set up to notify you of any comparable bikes being posted. ICBC will make you wait a month before they pay you out, so you might as well start shopping for a new bike. If/when you get your new bike do things differently when it comes to securing it. It is not unheard of for the same thieves to come back for seconds after stealing your bike a first time. And if you do find your bike let the cops handle it. If you don’t you might end up serving more time than the A-Hole that stole it. Don’t leave original insurance papers in the bike. And I know this sounds stupid, but don’t leave your spare key in the storage area of the bike; a butter knife and a little skill is all that is necessary to open it. As well, investigate what theft insurance would cost. Often, if you go through private insurers and/or opt out of the collision coverage it might be a nice piece of mind. Look, if you ride long enough you’re bound to have a bike stolen. Try to think of it as a compliment that your bike was nice enough to risk jail time to take. -Neil McCauley to Vincent Hanna in Heat. The information in this article was gleaned from personal experience and a fantastic AMA of an ex-bike thief on Reddit. It weighs in at just under 25,000 words on some 78 pagers but a fascinating read all the same. I have included the address if you are interested.